If there’s one thing that game journos across the world can wholeheartedly agree upon, it’s that movie tie-ins are, in general, not very good. There are some exceptions to the rule of course, but for the most part the games are rushed out to release alongside the film and palmed off as “for the kids”, and suffer as a result. Still, I’m always willing to give them a chance, hoping to find the ultimate game that captures the essence of the film while being fun and exciting to boot. Sadly, Madagascar 3 is not that game. 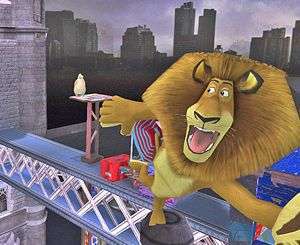 If you’ve not seen the films, possibly because you don’t have children to watch them with, the Madagascar series follows four animals: Alex, the egotistical lion, Marty, the slightly annoying zebra, Gloria, the diva hippo, and Melman, the hypochondriac giraffe, as they try to get back to their old zoo in New York after being shipped off to the wild. 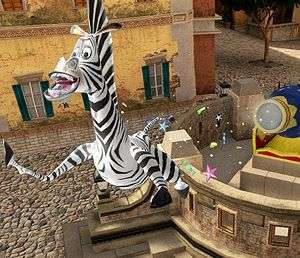 Madagascar 3: Europe’s Most Wanted, kicks off with the hapless bunch as new owners of a travelling circus, assigned the task of travelling from country to country, putting on great shows so that they can afford to put on a show in New York. Actually, why they can’t just take the train to the airport and sneak onto a plan to New York is beyond me, but hey, let’s stick with it. The game’s main gameplay focus is on co-operative play, and, as such, the entire game can be played in two-player, which is a nice feature that means you can play it with your offspring, or, if you’ve got two of them, you can leave them to it while you have a nap. Each character has a different ability, and so you have to work together to get through each level to collect an item for the penguin masterminding your return trip to New York. So, Gloria can swim underwater, tightrope walk (obviously) and use her gelatinous behind to knock stuff over; Melman can also tightrope walk and sneeze to scare away animals or stomp on stuff; Marty can fire himself out of cannons and jump incredible distance from specific launch pads, and Alex can double-jump, stand atop and swing from flagpoles and, of course, roar. In each level, you’re given two characters and an objective, which is to collect an item in a hard to reach place and return to the start of the level. If you’re flying solo, you can switch between the two characters at will, or if you’re playing with a friend then you just need to work together as each character. The game makes it pretty obvious where you need to go, with balloon animals strung up along the path that you need to follow, and great big glowing lights indicating what you need to interact with to progress. It’s all fairly simple stuff, and if you want to go off the path and just explore the, admittedly quite small, open area of the level, you can. Exploration is encouraged by a plethora of collectibles for each character, as well as a pesky little lemur that hides in one place and giggles incessantly when you’re in his vicinity. It’s all light-hearted, easy-going stuff that isn’t intended to challenge the younger player, but may well bore the older ones. Between the collection missions, you take part in some mini-games, which are pretty standard fare; there’s the one where you run around collecting as many floating collectibles as you can before time runs out (which you do twice per city), the one where you run away from the evil animal-control lady, picking up collectibles as you go to score points, and the one where you follow an annoying animal round and stick up posters against the walls where he throws mangoes for glue. The games aren’t bad, but they get repetitive really fast, and the “poster race” game is a particular snore-fest since there are just too many of the damn things to stick up. Once you’ve done about four collection missions and four mini-games, you’re then thrown into two platforming sections, which are easily the best bits of the game. The first section allows you to decorate the platforms with balloons and fireworks before you tackle them, but as it happens, there’s absolutely no point in doing so, so in the end I just skipped that and went straight to the platforming. These sections are great because it’s just pure platforming; there are no collectibles to worry about, no puzzles to hold up your progress, just jumping from platform to platform, occasionally dodging a giant swinging hammer or spinning platform. If the entire game had been made up of these sections, it would have been wonderful. However, we’re not done yet. After you’ve finished the platforming, you can finally perform at the circus, which is actually just a collection of mini-games. You start off selling tickets by hammering the right buttons in the order they come up, then serving snacks in a similar fashion. From here, games involve firing yourself out of a cannon in order to collect balloons, tight-rope walking, and jumping through flaming rings. 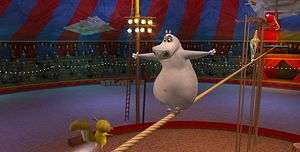 There’s also a trapeze act, which requires you to swing from pole to pole, you guessed it, collecting more balloons. It’s simple stuff, but the mini-games are actually relatively entertaining. The first time you do them. See, what I’ve just described is one country. After you’ve beaten all that, you move to the next country and do the exact same thing all over again. The order of collection missions and mini-games in the first half mix up a little, but that’s it. The circus mini-games are the same games in the same order every single time, only they get slightly harder each time. The complete lack of variation makes the whole thing horribly dull, and after the sixth instance of running around collecting balloons for no discernible reason, you’ll wonder why you’re even bothering. Just a few more mini-games would have gone a long way to make the game just that little bit more varied. Lack of variety isn’t the only thing dragging Madagascar 3 down. The game’s AI across the board is pretty awful. Throughout the exploration levels you’ll cross paths with animal control officers, who will chase you down and catch you if you scare too many people or walk into their eye line. But you can literally just walk straight past them, and most of them time you can just move to the other side of them and they won’t even bat an eyelash. If you do get found out, you have to run away before they catch you, but you can escape every capture attempt by hammering A. To avoid scaring pedestrians, you can enter disguise mode, which just throws a pair of sunglasses onto your character and forces them to walk everywhere, really, really slowly. Sound bad? Well, your normal running speed is fractionally faster than walking, so you’ll spend most of the game ambling around areas scaring the crap out of people because at least you get to places ever so slightly faster than by walking. Thing is, pedestrians only attract animal control if you scare them for too long, i.e. by walking into a group of them and standing still. If you just keep on running around, so long as you don’t bump into the animal control dudes themselves, you’re pretty much safe from being chased. As such, the whole animal control thing feels like a complete waste of time, since it’s so incredibly easy to escape from and avoid altogether. 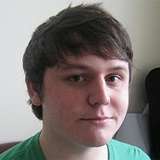 But never mind the enemy AI; it’s your friends you have to watch out for. When playing the exploration missions on your own, they’ll do no more than follow you around no matter where you go, unless you decide to start jumping up onto rooftops, at which point they’ll stay put. Personally, I think that’s great. Right up until the point where the AI forgets it’s supposed to be stood still, and wanders off the rooftop. And in the mini-games, whether on the streets or in the circus, the friendly AI is completely useless. If you want to get five stars on the mini-games, you have to be amazing, and completely carry your partner to even stand a chance. There was many an occasion where I missed out on five stars because my idiot partner had failed to achieve anything higher than three, which led to multiple repeats of the same mini-games I was already sick of. It’s frustrating that the developers couldn’t make the AI just that little bit smarter and help you out, rather than forcing you to carry all the responsibility. The graphics are passable, but nothing more. The character models are slightly blocky, but I think that might just be the art style from the films. I was surprised to find that, after coming out of the water, Gloria the hippo does actually appear to be a tad wet, which is a tiny addition that so many games miss out on. Other than that the environments are bright and colourful, but are nothing more than just stereotypical areas for each of the games three countries, Italy (featuring gondolas, despite neither level being set in Venice), France and England. 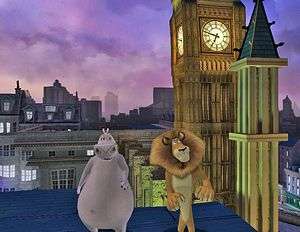 Actually, I have a particular bone to pick with the game’s imagining of London, which commits the greatest crime by referring to the Underground as a “Subway”. I don’t even live anywhere near London, and yet I felt so horrendously offended by the sign declaring “Subway” that I growled every time I walked past it. 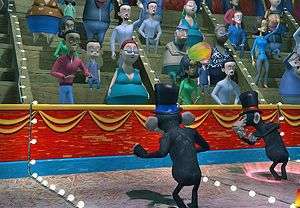 The music for the game is made up by one track for each country, and one track for the circus levels, playing on a continuous loop in the background. It’s not painful to listen to, but it does get a tad dull after a while. The voice acting, however, is atrocious. 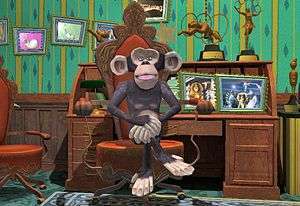 None of the original voice actors from the film return to the game, and while the stand-ins do a reasonable job (except for whoever voiced Melman, whose impression of David Schwimmer is absolutely brilliant at making him sound even whinier than he already does), it’s just not the same. What makes it worse is that the characters throw out the same four or five lines every time you do their special move, and even manage to have the same conversations twice in one level. Worse still, the pedestrians all have about one or two screams between the lot of them, which change between countries, but not by a lot. This reaches almost hilarious heights of shoddiness in the Paris levels, where each and every adult male has the same four-second scream when you walk past them. It’s poorly thought out and badly executed, and is easily the most annoying aspect of the entire game. But you know what? Maybe I’m looking at this wrong. Perhaps because I’m too old to get it, too jaded by years of playing the superior games that are often locked away from young ‘uns by age ratings. Thankfully, I did actually manage to get on hands on some children (not like that) and hand them some controllers, just to see what they thought. And you know what? They liked it. Yes, they had no idea what they were doing, despite the games clear guides, and yes they bickered incessantly about what to do and how to do it. On several occasions they handed the controller back to me when they got stuck. But after about an hour’s playtime, none of them wanted to put the controller down, and there was a unanimous agreement that it was, and I quote, “really good”. So there you have it. To an older, serious gamer like myself, this is yet another movie tie-in filled with lame jokes, tired game ideas, idiotic AI, terrible audio and mediocre graphics. But give it to a child, the intended audience of the piece, and it becomes a whole new beast. Despite what we older folk want to think, that the kids will never go for this, they do. So while it fails on so many other levels, it succeeds at doing what it was intended to do: keep the kids quiet for a few hours. And you know what? It’s not the worst game you’ll ever play. It’s as mediocre as a game can be, but it’s not really that bad. It just isn’t good either. Madagascar 3 is the definition of a kid’s game. Boring, repetitive, middling graphics, short run-time – yet hand it over to a child and they’ll lap it up. It’s by no means the worst game you’ll ever play, and, other than the dreadful AI, it’s solidly put together and bug-free. But it’s no fun, and you’ve probably played a dozen, better games just like it. If you’re looking for achievements then it’s not a bad way to kill eight hours and get 1000GS at the end of it all. And if you’ve got kids, and you need some time away from them, this’ll probably be right up your street. Otherwise, I wouldn’t bother. Ric, you’re a bloody madman, what with your enjoyment of simulation games and your willingness to take on movie tie ins, but I love that you also give them a fair shake. You’re amazing, essentially.